The nearly 2 year evolution of the side mount is now complete. Introducing the AK-300 system from RS Regulate. The AK-300 mount system is a rugged family of mounts for side rail equipped Kalashnikov rifles. The AK-300 system is the worlds first modular side rail system and is made of 6061 T-6 billet aluminum, Titanium and SS hardware and milled on precision 5 axis CNC controlled machine centers, the AK-300 system is the lightest and thinnest side mount in the world. 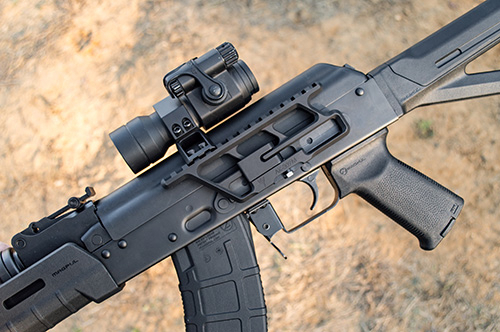 Based on the highly successful and exceptionally durable RS proprietary technology, the AK-300 system adds the capability to change upper optic mounts as needed and to position optics not only directly over-bore, but front-to-back. 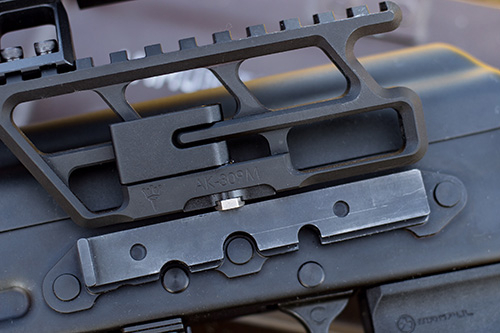 The AK-300 system also introduces the new low profile RS lock system built with titanium and aluminum that does not protrude from the mount or into the trigger guard area. Side mount rail base only, include optics mounts (like AKR or AKOG for example). This 309 Full Length lower mount will work with Century proprietary side rail only. Those side rails are currently used by Century on their C39V2 and newest RAS47.